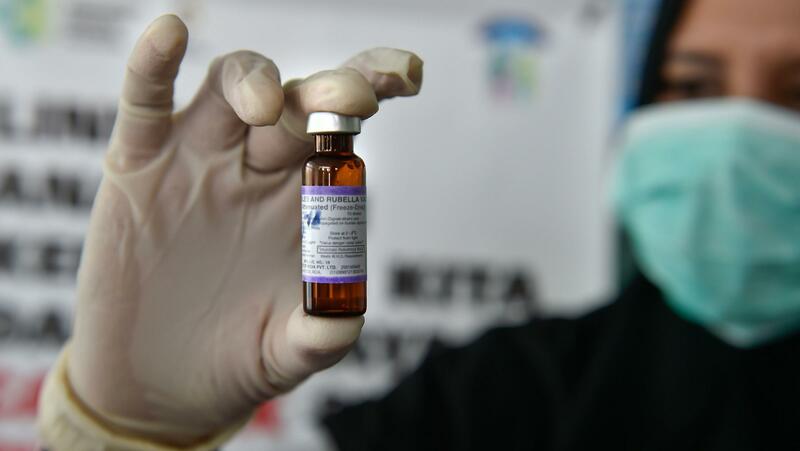 A medical worker holds a measles-rubella vaccine at a health station in Banda Aceh, Indonesia. "Without urgent efforts to increase vaccination coverage and identify populations with unacceptable levels of under-, or unimmunized children, we risk losing decades of progress in protecting children and communities against this devastating, but entirely preventable disease," Soumya Swaminathan, the WHO's deputy director general for programs, said in a statement released Thursday. The disease has also re-established a presence in other countries that had once been declared measles-free, such as Venezuela and Russia. "Since 2016, measles incidence has increased globally and in five of the six WHO regions," the organization notes, adding that only the Western Pacific region has avoided the larger trend. "The increase in measles cases is deeply concerning, but not surprising," Seth Berkley, CEO of Gavi, the Vaccine Alliance, said in a statement released Thursday. "Complacency about the disease and the spread of falsehoods about the vaccine in Europe, a collapsing health system in Venezuela and pockets of fragility and low immunisation coverage in Africa are combining to bring about a global resurgence of measles after years of progress. "Existing strategies need to change: more effort needs to go into increasing routine immunisation coverage and strengthening health systems," he added. "Otherwise we will continue chasing one outbreak after another."